<i>Phantasy Quartet, Op. 2</i> (1913-1976) David Weiss oboe, Brian Lewis violin, Roger Myers viola, Joshua Roman cello. While each half of this Tuesdays @ 8 concert program achieved classical clarity by way of works by Wolfgang Amadeus Mozart and Carl Maria Von Weber, the program also included obscure modern compositions by Benjamin Britten and Soviet polystylist Alfred Schnittke. This recital, too, was happily scheduled during the residency of cellist Joshua Roman and enlisted the brilliant 29-year-old for the opening number. The engaging, erudite, and easy-going Roman curated some performances in the galleries of the Santa Barbara Art Museum on Sunday, July 21, and then gave a stunning solo recital in a chic eastside loft on Wednesday, July 24. Britten was only 19 when he composed Phantasy Quartet, Op. 2 (1932), the first piece of the evening. Violinist Brian Lewis, violist Roger Myers, and cellist Roman formed a tight trio, bowing and plucking out a complex rhythmic substructure for David Weiss’s lyrical flights on the oboe. Next, Lewis and Myers took up Mozart’s String Duo No. 1 in G Major (1783), yet failed to summon the snap of Mozart’s cutting, forward-leaning rejoinders. A very unusual string duet followed intermission, Schnittke’s Hymn II (1979) for cello and double bass. Alan Stepansky and Nico Abondolo gave a superb performance of this daring work and exhibited masterful control over soft long-held tones, dynamics, and complex chords. Finally, an outstanding string quartet consisting of Academy Fellows Ka-Yeon Lee (violin), Jihyang Seo (violin), Matthew Sinno (viola), and Joshua Halpern (cello) played Weber’s Clarinet Quintet, Op. 34 (1815) with faculty member and clarinet wizard Richie Hawley. 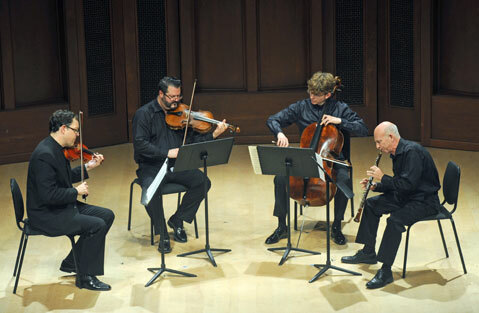 Hawley’s enchanting and articulate clarinet found ideal support in this sensitive and synchronized quartet.